I was considering some interesting custom rules which I could write a blog post about. I was about to write up a rule for formatting tagged dates in music files, but then inspiration struck - instead of doing something useful, why not use custom rules to rickroll my music library instead? 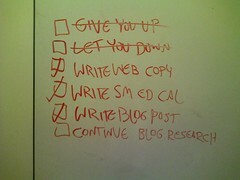 I'm not sure if this says more about me, or potentially the limited use of the custom rule idea! But I really, really do have some ideas for other useful custom rules to share, honest! I copied the partofset.regexrule and set to work. 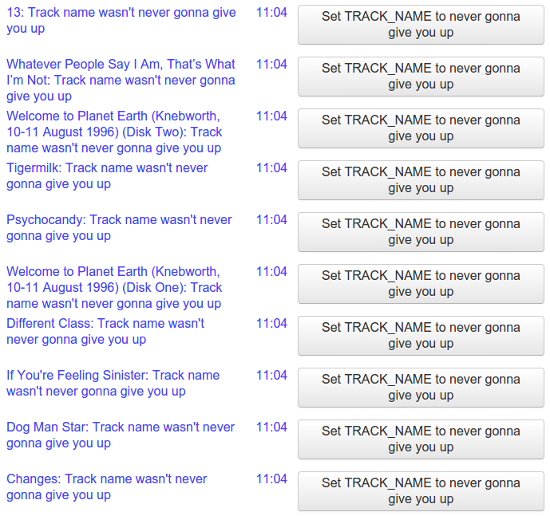 I wanted the rule to set all track names to Never Gonna Give You Up. find /^. *$/ replace with "Never Gonna Give You Up"
"find /^. *$/" means find all character strings, in their entirety. replace with "Never Gonna Give You Up" means... what it sounds like. I tested the regular expression here. Click Java and you can see a test string. You can alter the regular expression to test alternatives. Just a bit of fun... back to useful stuff next week!